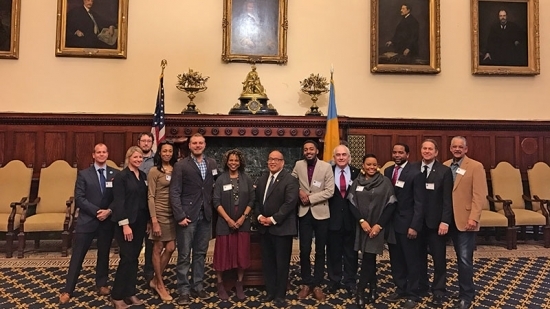 The Task Force will consider the history of the music industry in Philadelphia, evaluate the current state of the music industry in Philadelphia, and develop a strategic plan for the re-establishment of Philadelphia as a center of the world music industry. Its members are diverse and accomplished, with 10 having been nominated by City Council and the remaining 5 by Mayor Kenney. The Task Force includes musicians and vocalists, music composers, music lyric writers, music businesspersons, music academicians, music venues, music industry producers, music industry engineers, and music industry marketers. The following 15 individuals have been appointed to the Task Force: Kelly Lee (Chief Cultural Officer, City of Philadelphia Office of Arts and Culture), Justin Nordell (Executive Director, Philadelphia Folk Song Society), Suzzette Ortiz (Artistic Director, Artístas y Músicos Latino Americanos), Jesse Lundy (Vice President, Point Entertainment), Jeri Lynne Johnson (Artistic Director, Black Pearl Chamber Orchestra), Eric "Chill" Moody (Rapper), Dr. Louis Anthony deLise (Composer, Producer) , Carol Riddick (Vocalist), Bernard Resnick (Entertainment Lawyer), J. Erik Sabo (Professor, University of the Arts), Joanna Pang (Owner, Trocadero Theatre), Carvin Haggins (2-time Grammy Award-winning Producer), David Ivory (Grammy-nominated Engineer), Stephanie Seiple (Secretary, Philadelphia Chapter of the Recording Academy and Co-Founder of Tri State Indie), and Jeff Duperon (Radio Personality, 90.1 WRTI). Today's press conference included live performances by PHL Live Center Stage 2016 Jazz Winner Laurin Talese, People's Choice winner Kendal Conrad and Country/Folk finalist Ben O'Neill. SEE ALSO: Appointing 15 Individuals to the Task Force on the Philadelphia Music Industry.